You'll be £16.99 closer to your next £10.00 credit when you purchase Sea Warfare in the North Atlantic. What's this? Order within the next 3 hours, 57 minutes to get your order processed the next working day! The North Atlantic was the main battleground for the German submarines during the Second World War. From early 1942, the Anglo-American convoys ran through the northern route between Iceland and the ice-free ports of Murmansk and Archangel in Russia. The destruction of these massive supplies was one of the main tasks of the German U-Boats. the North Sea and played an integral part in the outcome. Land-based sea planes, reconnaissance and support aircraft were also significantly involved in the fighting. In the spring of 1943 the battles reached a climax, with the U-Boats and convoy escorts faced each other in a bitter struggle whose outcome would decide the fate of the war. Made up entirely from original wartime footage, much of which is unseen outside of Germany, this DVD tracks some of the many titanic battles at sea between the might of the British and American navies and the unrelenting killing ability of the German U-Boat. 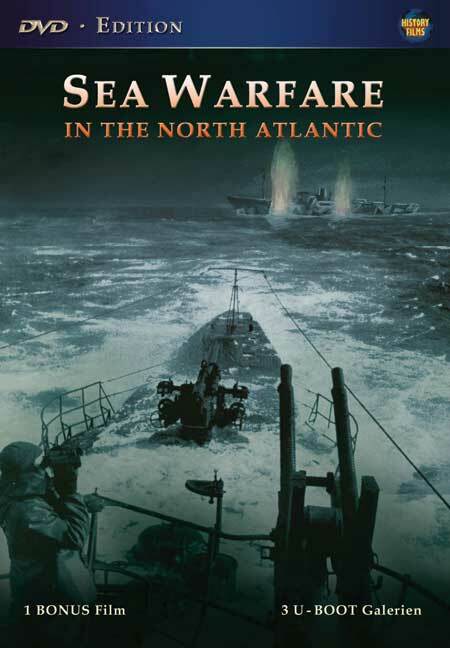 …includes rare and unseen archive footage portraying life at sea during the battle for the North Atlantic. The DVD looks at some of the many battles at sea between the British and American navvies and the German U-Boats. The DVD also includes one bonus film and three bonus U-Boat picture galleries. Wonderful footage taken from both sides of the Battle of the Atlantic. Featuring battleships, aircraft carriers, cruisers, destroyers, transports and U-Boats in action, this documentary describes the course of this most decisive of battles from 1939 to 1944, outlining the strategic difficulties faced by the Kriegsmarine in the initial phases, the tactics which they then developed to inflict terrible damage on the convoys, and, ultimately, the technologies and practices adopted by the Allies which turned the tide against the U-Boats; making the hunters the hunted.